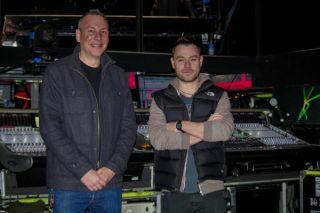 Madonna, renowned for her elaborate complex productions and exacting standards, has chosen a pair of DiGiCo SD7s to deliver audio for her Rebel Heart Tour. She achieves this with the Rebel Heart Tour’s Front of House engineer Andy Meyer and monitor engineers Matt Napier and Sean Spuehler. On the tour, Meyer and Napier are both using SD7s with Napier’s console featuring an EX007 fader expansion where Spuehler mixes Madonna’s vocals and effects. Madonna is an artist who likes to push the boundaries with her live production, and an arena tour can present several challenges. “It’s the first time I’ve run a show using timecode, which I’ve done partly to mitigate this. Having multiple snapshots per song, all fired automatically via timecode, has freed me to concentrate on the aspects of the mix that I need to adjust in compensating for the effect of her moving along the catwalk. Alongside Madonna, stage personnel comprise four musicians, two backing vocalists and 20 dancers. All of the musicians are on in-ear monitors, with additional monitoring for musical director/keyboardist Kevin Antunes, a thumper for drummer Brian Frasier-Moore and side fills for the dancers. Sean’s vocal group is bussed into Matt’s side of the SD7, where he adds it to the music mix in her monitors, as well as looking after the other musicians. In all, the monitor SD7 is set up with 118 input channels, 19 mono auxiliaries, 22 stereo auxiliaries, six stereo groups, four mono groups, 10 matrix outputs and 12 control groups. MADI is also used to record all the shows to Reaper DAW running on a Mac Pro and recording to a RAID drive. The recordings are archived to four terabyte backup disks, a copy of every show being kept.